The following was released this evening by the AFL. With the last game of Round 3 completed tonight we can reveal the preliminary finishing positions and which teams go to the top 4, which to Division 1 and the remainder to Division 2. Please note that we stress at this early stage these ladders are our own calculations and official confirmation is of course by the AFL. The Women's is straight forward and only goes to finals after 5 rounds (4 matches each). But the Men started divided into 3 pools, with the complication being that the top 4 that go through to the semi-finals after 3 rounds are the top of each pool and then the next best based on combining all the teams - hence we've also shown a Combined ladder. That also determines the teams that make what the AFL has called Division 1, i.e. teams 5 - 12, and Division 2, i.e. teams 13 to 18. Our expectation is that the 4 nations through to the top level men's semi-finals are: Ireland, South Africa, New Zealand and Papua New Guinea. France achieved a big win over Indonesia today, Les Coqs running out 106 point winners over the Garudas in their match at Digger’s Rest. As expected, a good crowd was in evidence at the ground and they had warmed to the occasion. Some locals were sporting colours of the International countries. In true Aussie tradition there was plenty of support for the underdog Indonesians. France started from the first bounce down using their superior strength, height and now experience to continually push the ball into attack to produce many scoring opportunities. Better accuracy would have seen Les Coqs comfortably in front. #13 Gregoire Patacq was already giving a lot of drive and contributed to the second French goal via #8 Jean Rosado who was providing a focal point up forward. Just before the siren #13 Gregoire Patacq threaded his way past multiple defenders only to push the ball wide of the big sticks with his kick. This report courtesy of Martin Davies. The South African Lions today put in a spirited performance to hold off a fast finishing PNG Mosquitoes side, South Africa ultimately triumphing by 9 points. At St Mary's Oval in the shadows of Simonds Stadium, home of AFL club Geelong, the pre-game preparations saw the PNG side warming up on the ground, whilst singing and clapping was reverberating from the South African rooms. The sides ran out at 12pm – PNG bunched in a tight huddle by the fence, waiting for everyone to come from the rooms, whilst South Africa streamed out like the players couldn't wait to get out there. The national anthems were sung with passion, followed by PNG's impressive war cry. The first quarter opened at a blistering pace, with South Africa into attack towards the river end. But the Mozzies defence held up well and repelled the ball forward, where Willie Asi kicked the first goal of the game for PNG from a boundary throw-in. St Kilda AFL team boast Joe as an international scholarship player, and he is a part of the New Zealand juggernaut that is hoping to take away their second International Cup title in 2014. So, what do we know about Joe? “[This is my ] first time at the International Cup but hopefully not my last! I had no idea this cup even existed. I only found out about it around March this year.” But we are certainly glad that Laura did. We preview tomorrow's Community Round with teams playing across Melbourne and into country areas Ballarat, Bendigo and Geelong among others. The battle to finish in the top four is well and truly on and results of many of the matches will be eagerly awaited. 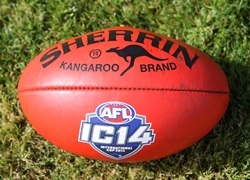 Ireland v Nauru 5:30pm Queen Elizabeth Oval, Bendigo after the 2.20pm Castlemaine v South Bendigo (BFNL) match. The formline suggests that Nauru are a chance to upset the Irish in Bendigo. Nauru accounted for Great Britain convincingly enough in the end. They showed that despite a lack of key position players they can beat a side that does have them. GB went down to Ireland by just a point in the Euro Cup last year so theoretically they should be very close to Ireland. Two factors that may come in to play is that the Australian based Irish weren't at the Euro Cup and Nauru's Adam Otto will miss the rest of the tournament due to suspension coming out of the game against GB. 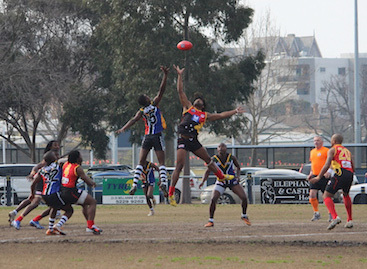 The Round 2 match between Nauru and Great Britain was for 3 and a half quarters a ripping game. Several times it looked like Nauru was set to run away only for the Bulldogs to claw their way back and with less than a goal in it at 3/4 time it was anyone's game. Nauru kicked out again in the last and 18 pts up the crowd wondered whether the Bulldogs had another burst left. Enter Steven Maguire.